In a nation famous for its sophisticated cuisine, the Italian region of Piemonte stands out as perhaps the most refined. Bordering France and Switzerland in the north-west of the country, the area is, as chef Antonio Carluccio puts it, "practically made of food". The region is also the birthplace of the slow food movement, which promotes traditional and regional farming and cooking as an alternative to fast-food chains. Meat is key to this tradition, and many of the most famous Piemontese dishes contain meat, from fagioli grassi (sausage and borlotti beans) to bollito misto (a stew made with veal, beef, sausage and poultry). This may be about to change, however, in one part of the region at least. Chiara Appendino, the new mayor of Turin – Piemonte's capital – and a rising star in the anti-establishment Five Star Movement (M5S), has released a manifesto that promises to make the promotion of vegetarian and vegan diets a "priority". Appendino, who was elected mayor of Turin in June with 55% of the vote, said vegetarian diets would be encouraged “to protect the environment, health and animals”. The 62-page document did not lay out exactly how it would encourage the city's population to eat less meat, but, according to the Guardian, "the city is expected to set up educational projects in schools to teach students about animal welfare and nutrition." Are we eating too much meat? Mayor Appendino has set herself a formidable challenge. Though people around the world consume an average of 75lbs of meat per person, per year, according to the OECD-FAO Agricultural Outlook 2014, in the European Union this number climbs to 142.9 lbs. In other parts of the world, consumption is even higher. Australians are the world's biggest meat eaters, consuming almost 200lbs each every year, closely followed by Americans. 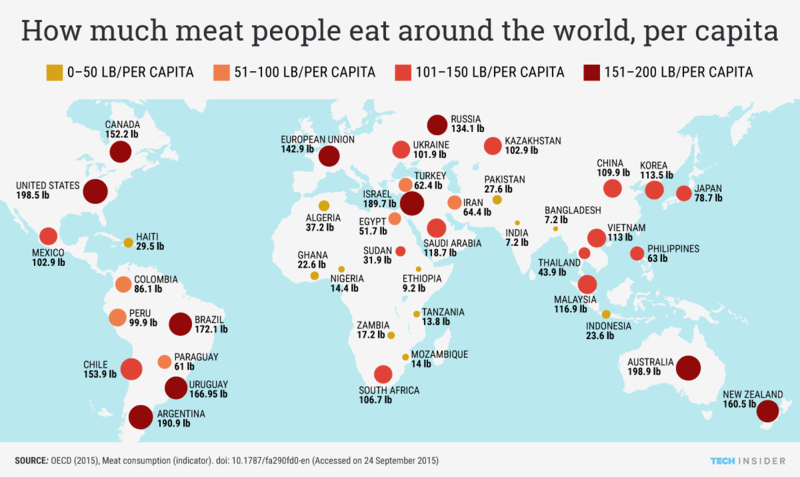 In developing countries, meanwhile, consumption is much lower, largely due to the prohibitive cost of meat as well as cultural norms in places such as India. Though Appendino's idea was ridiculed by many on social media, recent trends suggest that more and more of us – especially the younger generation – have felt the need to switch to a vegetarian, or at least flexitarian, diet. A 2014 study by Mintel found that the number of vegetarians in the UK has risen to a record high of 12% of the population (20% among 16-24 year olds). Americans, meanwhile, are eating about 20lbs less meat per person per year than they were 10 years ago. Even in Turin, the number of vegan and vegetarian restaurants has climbed to 30, according to Corriere Della Sera. This shift could partly be attributable to recent health warnings over excessive meat consumption. Late last year, the World Health Organization ranked processed meats alongside smoking as a cause of cancer. It's noteworthy that among the Turin mayor's reasons to turn vegetarian is "to protect the environment". The impact of meat consumption on the environment is considerable. The FAO, for example, estimates that domesticated ruminants (such as sheep and cows) release 100 million tonnes of methane into the atmosphere every year. Beef is particularly harmful, as it requires 28 times more land to produce than pork or chicken, 11 times more water and results in five times more climate-warming emissions. There is also concern over the amount of land, grain and water required to raise cattle. “The biggest intervention people could make towards reducing their carbon footprints would not be to abandon cars, but to eat significantly less red meat,” said Professor Tim Benton from Leeds University in a study published in the National Academy of Sciences. Meanwhile, another study suggests that a shift towards a more plant-based diet could reduce food-related emissions by between 29-70%. It's a message that's been heard far beyond northern Italy. China's government has called on its citizens to cut their meat consumption by 50%. Although primarily a move to curb runaway rates of obesity, heart disease and diabetes, it was widely applauded by climate campaigners including Hollywood star Arnold Schwarzenegger. Can eating less meat really tackle climate change?